Sunday night Chad offered to make dinner. He made salads with salmon fillets on top. I have to admit that I wasn't digging the salad, because it didn't taste good -- kind of bitter. I figured that I put the wrong dressing on the salad, or that I am too accustomed to restaurant cooking, and that's why it tasted weird to me. I ate the salad anyway because my nice husband went to the trouble to make a healthy dinner for the two of us. Monday morning rolled around and I awoke feeling weird. I had a slight headache and felt hungry but also a little nauseous. I had a Luna Bar and a Diet Coke (breakfast of champions!) thinking that the combination would provide vitamins and caffeine without too much tummy trouble. By lunchtime, I felt weak and a bit shaky. I reached for a ready-made falafel wrap, and the sight of the lettuce on my intended lunch sent me running for the bathroom. I'll spare you the gory details, but suffice it to say that Chad and I were both ill. Both repulsed by the mere thought of lettuce or salad. Chad thinks that the food-poisoning culprit was lettuce that went a little long in crisper. I don't know for sure, but I won't be having any salads or salmon again for a while. Chad continues to apologize profusely. I'm fairly confident that he wasn't trying to kill me since he got sick also. If he was up to no good, maybe he's learned his lesson that bad deeds typically backfire. Or maybe it was all an elaborate ruse to get me to cook more, fearing for our health and welfare. Hugh Dancy will be thrilled to know that he is my new celebrity crush. He ascended to the title after I saw him in the movie Evening. Isn't he dreamy? He's British, so you know he talks pretty. He looks a bit like my husband, which adds to the perceived attractiveness level (or PAL for short.) I'm looking forward to Mr. Dancy's next movie The Jane Austen Book Club. My celebrity crush position has been vacant for several months now. Previous celebrity crush, Pete Wentz, fell from grace when he started dating Ashlee Simpson. They make a cute couple and I wish them much happiness. However, I feel that Pete's emo-rocker card should be revoked now that he dates a pop-tart like Ashlee. Pete also lost points when he got into a few highly publicized fist fights. I don't like men who resort to violence so quickly. I think I've been watching too much television and seeing too many movies lately. When I met my friend, Tara, at the mall tonight to see Evening, I people-watched for a while as I waited for her. Members of the general public are not nearly as attractive looking as the stars of the small and large screens are. My perception is getting warped from looking at too many pretty people. I'm sure that every one of us would benefit from a professional hair and makeup crew, professional lighting, editing and a generous dose of film retouching! I have terrible allergies, pale skin and a love of reading and watching movies. That's why I'm thankful for Claritin D with Flonase, Neutrogena oil-free sunblock, Book People and Regal Cinemas. Now that I have a house, there's a compulsion to take care of the house not just inside, but also outside. I'm not outdoorsy. I describe myself as "indoorsy." (My friend, Maggie, agrees with me that indoorsy should be a word, because it is quite descriptive of our shared interests.) Alas, sometimes one has to venture outside and make an effort to keep the yard looking nice. There was a dead tree in our side yard that Good Morning Tree Service removed last Thursday. In its place, Chad helped me plant these Pride of Barbados plants. They're pretty with bright blooms and do very well in Austin. The plants we put around the base of the deck back in June love all the rain we've had this summer. I finally found a St. Francis statue that I like. It was 25% off at Shoal Creek Nursery. I love Shoal Creek Nursery. 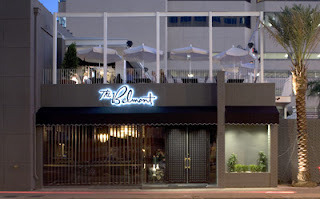 It's less than a mile from our house, has great native plant selections and friendly staff. Visit them at 2710 Hancock Drive in Austin. Last night, I actually slept for six and a half hours. Tonight, I got up after trying for an hour (unsuccessfully) to go to sleep. And before you ask: I got up at a regular time this morning; I went to the gym today and did an extra strenuous workout thinking it would make me tired; and I didn't have any caffeine past 4:00 PM. I dyed my hair from dirty blonde, or pool-blonde as my mom called it, to black for a theatre show in which I was supposed to look Italian. The black didn't take well over the blonde. After a few days, it faded to an army-green color. My Algebra II teacher sang "It's Not Easy Being Green" in her best Kermit the Frog voice to me each day when I entered her classroom. Also in tenth grade I was awarded "thespian of the year" by my theatre teacher. If you go to Vines High School in Plano, Texas, there's a plaque with my name on it, along with about thirty other thespians. I'm fully aware of the nerd-factor. I was a deacon's daughter and I dated the preacher's son for a while. The preacher's son was two years older than me. If we had ever actually kissed, it might have caused a major scandal. I read "The Fountainhead" by Ayn Rand to impress a boy, but after reading it, I decided I didn't like the boy anymore. I decided that I wanted to marry an architect someday instead. Although I did date an architecture student in college, my husband is not an architect and that's fine. I drove a few times without a license, and without a licensed driver in the car to help me. My dad said it was okay. Luckily, I never got pulled over by the police. If I needed a mental-health day away from school, I'd plea my case to Mom, because she usually said yes. I was allowed to start dating when I turned 16 in the tenth grade. Oddly, that was also the year that my parents decided I needed braces and got thee not to a nunnery, but to the orthodontist. Same thing. I had big hair in the form of a double-piggy-back-spiral perm. I told everyone the curl was all natural. For the record, the wavy hair I have now is natural, you can ask my stylist, Monica at Maximum FX. I ran with the drama kids (histrionic dorks) and some of the drill team babes. It made for a few awkward social outings before I realized that I should keep the two groups of friends separate. I like to think I'm the person who introduced the drill team girls to the music of New Order, but it was the brainchild of my drama class and drill tream pal, Jenny. She even did a choreographed routine to the song Bizarre Love Triangle. Very progressive, huh? I tried to be a vegetarian, but after several months of not eating meat (no, not even fish) I broke down and ate half of a Monte Cristo sandwich from Bennigan's. Yuck. For numerous reasons, few of which I can remember now, because I'm so tired, I am having trouble sleeping lately. I envy my cats and their amazing ability to sleep for long stretches of time. When Sonic (pictured above) stretches out for his nap, he really stretches out. That's a long kitty. Last night stretched fitfully into this morning with lots of stress dreams. You know what I mean, the dreams where you are working on something, or you are involved in a nerve-wracking task or some kind of stressful communication, or you are being chased, and sometimes you are simultaneously in your birthday suit. These stress dreams disrupt your sleep cycles when you jar awake trying to reorient yourself to the fact that it was only a dream, that you should be sleeping peacefully. You look at the clock and think, if I can fall asleep now, I'll get a good three hours of sleep. The pressure to get some quality sleep then gives you another stress dream and the whole night turns into one big toss and turn fest. I have a few nights like this every three or four months. I do not want to take sleep medication and develop a dependency on, then a resistance to, said sleep medication. I prefer to tough it out. I pretend I have jet-lag and get up at a usual time and stay up until a reasonable bedtime, but the past week has not been optimal snooze time. And I didn't earn the jet-lag by going anywhere fun. A year ago today, Chad and I were working hard to whip this old house into shape. We had only two rooms painted and unpacked: the guest bedroom, which we lived / hid in the first six months here; and the living room / dining room, which we didn't spend much time in because we could see into the other rooms that weren't painted yet, full of unopened moving boxes. It was hot. We were, no doubt, covered in little speckles of paint and primer. I think we had hot water for showers and washing dishes at that point, but I can only really remember that the gas guy took several weeks to show up and actually turn on the gas for the gas hot water heater and gas stove after we moved into this house. Last fourth of July, I distinctly recall begging Chad to take a break from painting and cool off with me. We positioned ourselves squarely under an air conditioning vent and sprawled out on the living room floor. I flipped on the TV for some brain candy, and found that the USA network was showing back-to-back episodes of Monk all day. Yay! I love this goofy mystery show about a detective who has obsessive compulsive disorder and a plethora of phobias. Chad and I watched an episode and half of Monk before we dragged ourselves back into whatever room we were working on at that time. I set our digital recorder to record Monk anytime it came on TV. Whenever we took a break from working on the house for the rest of the summer, there was usually a recorded Monk to watch. I came to associate the theme song of Monk with happy times when I could set down the paintbrush or screwdriver for a while, temporarily ignoring the long list of chores. The Monk theme song would start. My eyes would glaze over slightly. My brain would bask in happy chemicals. My back would relax into the floor, for I was far too dirty to put my icky, paint-splattered self on the sofa. 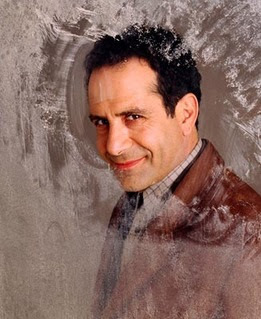 Watching episodes of Monk took me to my happy place. There are a gazillion reasons to love living in Austin, and I just found one more: free Sunday night movies under the stars at The Belmont. Despite more predicted rain storms, the weather was perfect. The pesky mosquitoes stayed away. My dinner, a delicious Cedar Plank Salmon Salad, was great. 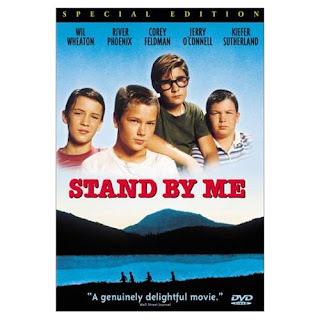 This week's showing was Stand by Me, based on Stephen King's novella "The Body" (from the book Different Seasons.) The story is about four friends and an adventure they shared when they were 12 years old. Katie and Brian, two of the cutest newlyweds you've ever seen, joined me. Brian is a Stephen King fan who had never seen this flick, and he gave it a thumbs-up.